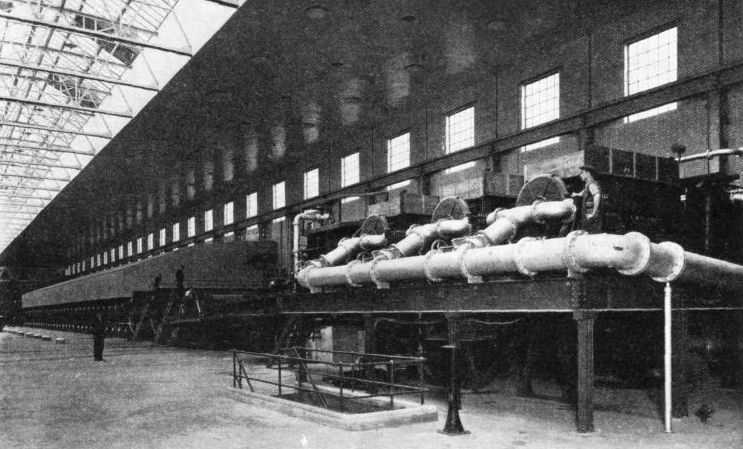 THE MACHINE DRYING SECTION of the Imperial Paper Mills, at Gravesend, Kent. In this machine the humid newly-formed paper is passed over rollers which are heated by steam. Paper passes through the machine at the rate of 850 feet a minute and is wound on to rolls 12 feet wide. For each ton of paper made 175.6 tons of water have to be removed. OF all the materials on which man has transmitted his thoughts by arbitrary symbols - the clay tablets of Babylon, the papyrus of ancient Egypt, the vellum of the medieval monk, the linen rag paper of our grandfathers’ days - none has ever been used in such quantities as paper made from wood. To-day, newsprint, as this paper is generally called, is consumed in amazing quantities, a single edition of one New York Sunday newspaper alone needing for its production the closely-packed trees of nearly a hundred acres of forest. With consumption on such a scale it is no wonder that anxious attention is now being paid to reforestation, particularly in Scandinavia. Most of Great Britain’s newsprint comes from Scandinavia, Canada’s output being at present largely absorbed by the United States. Canada’s resources are, however, almost illimitable, and the danger of depletion is not from felling but from the frequent devastating fires which are unfortunately nearly always due to human carelessness. These fires, in addition to causing the loss of timber, entail much expense in fighting them and patrolling threatened areas. Comparatively few species of tree can be used, the chief source of supply being spruce, a tree of the kind familiar to the town dweller at Christmas. Felled in the frozen forests of the dark-North during winter, the straight trunks are there and then stripped of their branches and stacked ready for transportation to the pulp mills. These mills are generally situated as low down a large river as possible, because they require a plentiful supply of water for the pulping processes and enormous quantities of electric power for their operation. The power is cheaply obtained from the flowing water by turbines. The river provides an easy method of transport for the timber and, in Canada, is nearly always so used. As the rivers are set free from the imprisoning ice in the spring, the stacked logs are tipped into the water to begin their journey, sometimes as much as fifty miles long, either in great rafts if the river is fairly free from broken water, or singly if it has many rapids. The logs may be from 15 feet to 16 feet long and perhaps 9 to 10-in in diameter at the largest part of the tapering trunk. The bark is left on. Arrived at the pulp mill, the logs are shepherded into still water into which the base of a chain conveyer dips. Guided on to this, they are carried by it to the sawmill on the river bank, where they are cut up into sections. The length of these sections is determined by the machines used in the subsequent processes and is always uniform for a particular mill, although it never exceeds 4 feet. REMOVING THE BARK FROM THE LOGS, after they have been sawn into pieces of uniform length, is the first step towards their conversion into wood pulp. These pieces are fed into rotating drums formed of steel channels with intervening spaces. The bark is rubbed off by the “rumbling” of the logs one against the other and is washed through the spaces by jets of water sprayed into the drums. The next stage is the removal of the bark, a process generally effected by “rumbling” the logs in immense rotating drums built of heavy steel channels with intervening spaces. This motion rubs off the bark, which is washed out of the drums by jets of water and is later disposed of by being burnt under the steam boilers of the mill if these are externally fired. In the modern pulp mill, however, steam is often generated electrically by passing a heavy current between electrodes immersed in the water of the boilers. 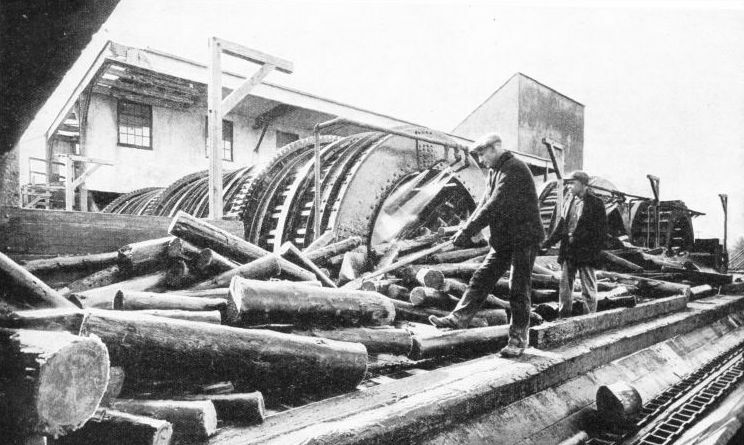 The logs, now free from bark and all of the same length, are then conveyed to the store yard and stacked by conveyers in immense piles containing about six months’ supplies for the mill. The strong sun of the Canadian summer soon dries them. From these heaps the logs are taken as required to be disintegrated into fibres, not into long threads or splinters, but into much smaller particles, the largest of which average only 3 millimetres in length. This length is easily visualized by a glance at a man’s right-hand little finger, the nail of which is normally almost exactly 10 millimetres (over ⅜-in) wide. The breaking down of the wood into fibres is done in two ways, one wholly mechanical and the other chiefly chemical. The mechanical pulp contributes 80 per cent of the mass of the finished paper and the fibres are, on the average, about 1 millimetre long. These are “felted” together to give a smooth dense structure to the paper, but, as such a structure is not strong, the remaining 20 per cent of the paper consists of chemical pulp. The fibres of this pulp, about 3 millimetres long, are, due to the chemical treatment, a much purer form of cellulose than are the ground fibres, and they are more flexible and stronger. Their function is to bind the shorter fibres together. Mechanical pulping is the cheaper of the two processes, and consists simply of grinding the wood down under a stream of water to a substance resembling thin porridge in consistency. The grinding wheel is mounted on a horizontal shaft and may have a diameter of about 4 ft 6-in. It is often made of millstone grit, a stone imported from Derbyshire, though recently experiments have been made with artificial stones of carborundum and similar hard abrasive substances. The logs are pressed up to the surface of the wheel in several different ways, but in a common type of machine hydraulic power is used. In this machine a pair of hoppers extends from the charging floor above the grinding room to about the centre of the wheel. Each hopper ends in a pocket, one side of which is formed by the moving face of the wheel and the other by a movable plate, behind which is a hydraulic plunger. The two pockets are on opposite diameters of the wheel. The logs fall from the hoppers into the pockets and are kept pressed up to the wheel until they are ground away, when the plunger is withdrawn to admit a fresh supply. The fibres, as they are ground off, are washed away by a stream of water. The grinding-room of a pulp mill is a hot and noisy place. It is hot because of the friction generated by grinding. As the surface of the stone is rubbed against the wood at a speed of about 3,200 feet a minute, and as about 1,250 horse-power may be required for each machine, a great deal of heat is generated. The grinding operation calls for more skill and knowledge than is apparent at first sight. The finish of the stone, the speed at which it is rotated, the degree of pressure on the wood and the amount of water supplied have all to be correlated for each particular wood to ensure that the largest possible proportion of small fibres shall be produced. The ground fibre from each machine is collected and pumped to another room for further treatment. The chemical process begins with the mechanical breaking down of the logs into chips rather more than ½-in thick and varying between 1-in and 1½-in across, the outline being irregular, as wood chips generally are. The chips are formed by rotating cutters, and the only object in thus cutting up the logs is to make easier the cooking process, to which they are next subjected. The cooking is done in tall, cylindrical vessels commonly about 15 feet in diameter and 50 feet high. These vessels, known as digesters, are strongly made of steel and are lined with acid-resisting brick. 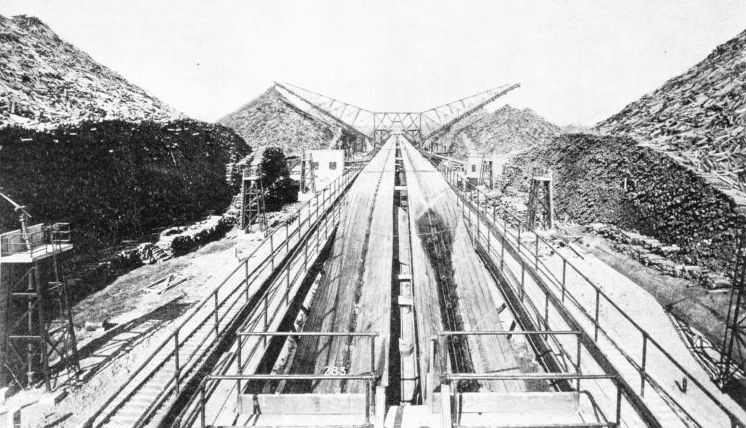 TROUGHED CONVEYERS deliver stripped logs at the Gatineau Mills, in the Province of Quebec, Canada, to the storage yards. In the centre background is the travelling stacker which piles the logs into huge heaps where they are stored until required in the pulp mill. The top and bottom are closed, as steam at a pressure of about 120 lb per sq. in. is admitted to the interior to heat up the contents. The contents comprise a charge of wood chips and a solution of sulphur dioxide, water and bisulphate of calcium or magnesium. The steam pressure is kept on for about twelve hours, during which the temperature of the mass is maintained at approximately 300 degrees Fahrenheit. The chemical reactions break up the wood into cellulose fibres which are free from any mineral salts originally contained in the wood. The duration of the cooking process is determined largely by experience rather than by the measurement and calculation used in many other chemical operations. When cooking is completed the pulp is blown out of the digesters into a tank. Here it is washed to remove all the traces of the solution. It is then pumped to the room to which the mechanical pulp also is delivered. The two sorts of pulp are here diluted with water and passed through several screening operations to remove oversize fibres. The graded pulp has then a considerable part of the water removed and is stored in large tanks before being blended in the required proportions. At this stage colouring matter is generally added to whiten the finished paper by neutralizing the natural yellowish tinge; and alum, china clay, and perhaps some size are also added to act as fillers, that is, to fill up the pores and enable the surface of the paper to be given a smooth finish. The ideal newsprint is one with a surface giving a bright contrast with black or coloured printing ink and at the same time being so opaque as to prevent the ink from showing through on the other side. The modern process of transforming the pulp into paper embodies a principle used in the early days of paper making - that is, passing water containing diffused pulp through a fine sieve or screen, when the water runs away and a thin layer of pulp is left behind. This layer, when removed from the screen, dried and glazed, is the finished sheet of paper. Up to the year 1803 in England all paper was made by hand in this way, and, as the screens could not be readily handled if the paper was larger than 20-in by 30-in, this determined the size of the newspaper of the day, a single sheet folded once giving four pages 15-in by 20-in. The first paper-making machine was invented by a Frenchman, Louis Robert, but it was of little practical use until improved in England by two brothers of the name of Fourdrinier. They ruined themselves financially while giving to the world the machine on which all newsprint and many other kinds of paper are nowadays made. The paper-making machine is generally known to-day as the “Fourdrinier”, and of recent years has progressed at an amazing rate in size and in capacity. In 1848 it was announced that a machine had been made which could turn out a ton of newsprint a day, and this was thought wonderful. 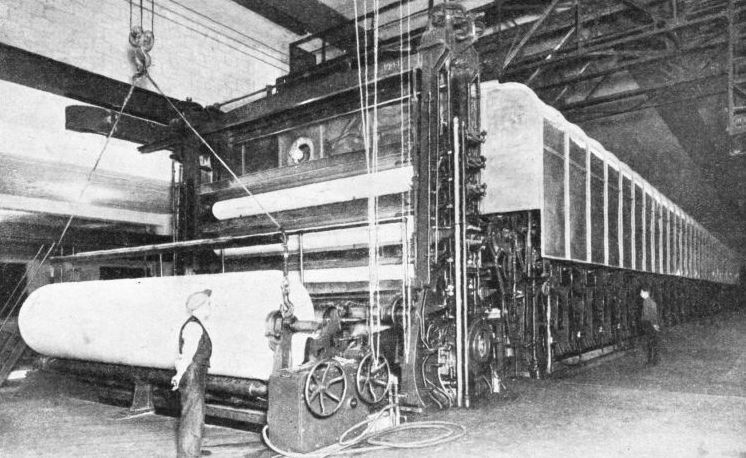 In 1936 there was started up in Kent a machine capable of producing 200 tons of finished newsprint every twenty-four hours. Moreover, instead of the old maximum hand size of 30-in, this new machine has a screen 26 ft 8-in wide. The finished paper is 25 ft 4-in wide and comes out of the machine at the rate of 1,400 feet a minute - that is, a piece of paper having an area of about 590 square feet is produced every second the machine is working. 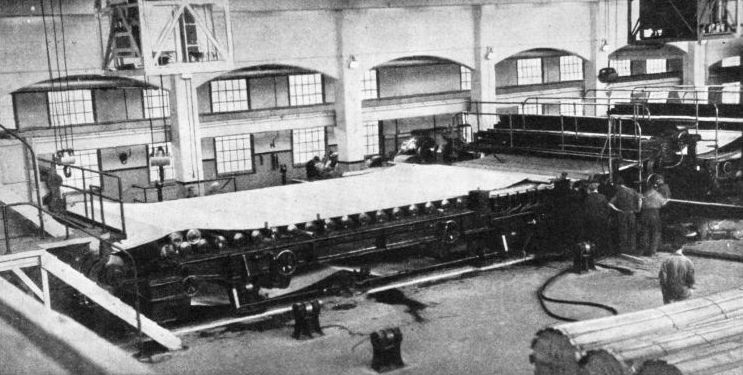 THE LARGEST PAPER-MAKING MACHINE IN THE WORLD. The white pipes convey the stock (pulp and water) to rotary strainers, from which it passes to a tank known as the flowbox. The press section is distinguished by the two men on its platforms. Towards the left, beyond the men, is the drying section, covered by an immense hood to carry away the water vapour driven from the paper by the hot cylinders. In British paperworks, however, with certain exceptions, the pulp is imported in small sheets resembling thick coarse blotting paper. This is shredded up and beaten with water to make a liquid similar to that delivered to the storage tanks in the pulp mills. This liquid is sometimes known as “stock”, sometimes as “furnish”, and is what is used for paper making. The method of its transformation into newsprint is exactly the same whether the newsprint is made at the pulp mills or in mills using imported pulp sheets. The Fourdrinier machine begins with what is known as the flowbox, a large wooden tank divided by partitions attached alternately to the bottom and to the top, the topmost partitions not quite reaching to the bottom. The stock flows through the box in a kind of zigzag fashion, the object being to prevent the fibres from clotting together before discharge. This is no easy matter in a modern wide machine, despite the fact that the stock as fed to the box consists of only one part of pulp to one hundred parts of water. The outlet from the flowbox consists of a narrow opening extending for the full width of the box, the depth of the opening being regulated by an adjustable gate called the slice. The stock as it flows through the box resembles in appearance a heavily watered milk, and to anyone scooping up a palmful it seems incredible that this thin liquid should appear at the far end of the machine as a tough sheet of dry paper. The stock flows under the slice on to a moving wire sieve or screen which corresponds to the old hand screen but is immensely larger. It is formed in an endless band perhaps 27 feet wide and anything up to 300 feet in length. This band consists of a screen of fine phosphor-bronze wire woven similarly to loose cloth. For newsprint on which illustrations are to be printed there are, as a rule, sixty-six wires an inch lengthways and crossways, that is, a square inch of the screen will have 4,356 holes in it. These screens are costly and a life of a month is considered good. As the band is endless the ends of each wire have to be joined together, a task requiring great care to avoid un-evenness at the join. At the works where the screens are made the joining is done by girls, who have to use strong magnifying glasses and cannot work longer than five hours a day, so trying is their task. The top strand of the screen, which is generally known as the “wire”, is carried, near the flowbox, on a large-diameter roll called the breast roll, then on a number of smaller rollers, the table rolls, arranged close together. After these come a number of wooden boxes and finally another large roll called the suction couch roll. The bottom strand, having left the couch roll, is supported by other rolls in between it and the breast roll. The couch roll is generally driven by an electric motor and causes the wire to travel in such a manner that the top strand is moving away from the slice (from under which the stock is flowing) in the same direction as the flow. It is the aim of paper makers to get the stock flowing evenly over the whole width of the screen and at the same rate as the screen is moving. The watery stock flowing on to the wire is now to be separated into water and a layer of pulp. A considerable amount of the water drains away through the wire in the neighbourhood of the table rolls, the revolution of which creates a kind of suction effect, and the fibres begin to settle down. But they must be encouraged to “felt” together and to this end the whole wire, rolls and all, is given a rapid sideways “jigging” motion, carefully regulated to avoid such untoward events as premature settlement of the fibres. By the time the fibres have reached the end of the table rolls they are sufficiently well arranged to permit them to be consolidated. This is done as the film of pulp passes over the suction boxes. These are generally narrow brass boxes with tops of smooth hardwood perforated with numerous small holes. A vacuum is maintained in the boxes by air pumps and, as the screen is passed over them, more water is sucked out. A final draining is given by the suction couch roll. This is perforated and has a stationary vacuum box inside it so placed that a suction effect is given to what is now paper just before it leaves the wire. THE FOURDRINIER MACHINE for the manufacture of newsprint transforms wet pulp into smooth paper in reels. From the flowbox (left) the stock flows through an opening under an adjustable gate known as the slice on to the fine screen or “wire” through which some of the water drains. The wire is an endless band travelling on rollers and carries the stock over suction boxes which extract more moisture. The pulp fibres have then sufficiently consolidated to be drawn into the presses and driers, whose action is explained below. Finally, the paper is given a smooth surface by passing between calender rolls, and the finished paper is fed on to reels. 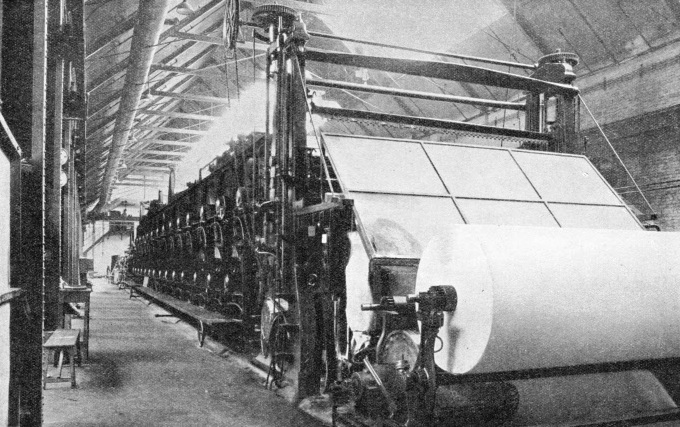 THE ARRANGEMENT OF ROLLERS through which the paper passes in the press section (left) and the drying section (right) of the Fourdrinier machine is rather complicated. Newly forming paper from the wire is drawn on to a felt band arranged on a system of rollers. The felt carries the paper between the first press rollers and transfers it to a second felt band and so on. The drying section is even more complex, but it can be easily followed in the diagram. The paper, supported on felt bands, is passed over a large number of cylinders containing steam. The paper still contains about 75 per cent by weight of water and is much too tender to be handled until it is dried. It has, however, sufficient strength to be drawn across a small gap on to an endless felt band. One of the rollers carrying the felt band is close to the suction couch roller. The paper now passes through the press rolls, of which there are normally three pairs. The purpose of these rolls is to flatten the paper and squeeze out more water, much as clothes are treated in the domestic mangle. There is this difference, however. The paper in the Fourdrinier machine is not put through the press rolls by itself, but is carried on a continuous felt band. One side of the paper only, therefore, comes into contact with the smooth surface of the rolls; the other side is in contact with the felt and is therefore rougher. At one time the paper was reversed at the third press rolls by an ingenious arrangement of rollers and felts so that both sides were finished in the same way, but in the more recent machines this complication has been omitted and the paper is taken straight through the third press. Paper made in this way can generally be distinguished by the different finish of the two sides of the sheet. The first two sets of press rolls have their bottom rolls generally of similar construction to that of the suction couch roll, for although the felt comes in contact with them the moisture absorbed by it is extracted by vacuum. The bottom roll of the third set is, on the contrary, not a suction roll but has an unbroken surface covered with soft rubber. The upper rolls are, in most instances, of highly polished solid granite. The pressure on the paper passing through the press rolls varies from 6 tons to 7 tons. The felt band is carried on a set of rollers, some of which are adjustable so as to keep it stretched, others being formed in such a way as to keep it flat across its width. Then there are vacuum boxes and cleaning apparatus for drying and conditioning the felt. Any fibres adhering to the top press rolls are scraped off by a long knife called a “doctor” and are deposited in a trough. Having left the third press rolls, the paper still contains well over 60 per cent by weight of moisture, and the only practicable way of getting rid of this is by evaporating it, in other words, by drying the paper. It is accordingly passed over the outside of a large number of cylinders containing steam. In a large machine there may be sixty of these drying cylinders. They are arranged as a rule in two rows, an upper row and a lower one, and the paper passes from one cylinder to the other in zigzag fashion. Here again the paper is supported on felt bands or, more correctly, is kept in contact with the hot surface by the bands. These bands are endless, that is, they pass over the drying cylinders continuously, whereas the paper passes over them only once on its way through the drying section. The drying cylinders may be anything between 5 feet and 6 feet in diameter. They are carefully machined inside and out so that they can be accurately balanced. Steam is introduced through a pipe in the centre of the bearing and the condensate is taken out by a pipe at the same point. What the steam in the cylinders has to do is best understood by considering how the water in the stock has to be got rid of. F or each ton of dry paper made 175·6 tons of water must be removed. Of this total 140 tons pass through the wire, another 30 tons are removed by the suction boxes and the couch roll, and 3·1 tons are extracted in the press section. This leaves 2·5 tons to be evaporated by the drying cylinders. It would not seem a large amount compared with that taken out in the earlier stages, though if we consider a machine producing 200 tons of paper a day, the evaporation of 500 tons of water in that time is a big task. It takes nearly 600 tons of low-pressure superheated steam to do it. 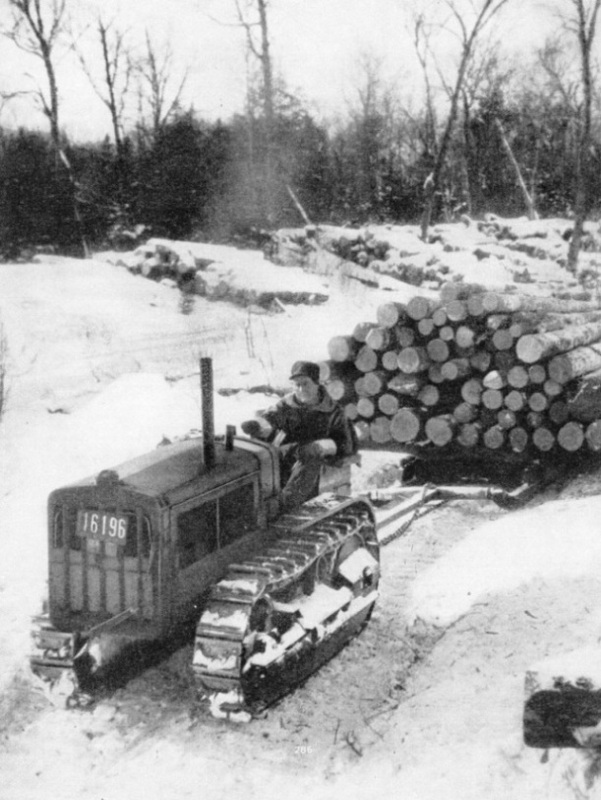 TRANSPORTING FELLED TREES in Canada is often done on sleds drawn by crawler tractors. The species of timber mainly used is spruce, which is felled during winter and stacked ready for transport to the mills in the spring. The logs are generally floated down a river to the pulp mills. The water in the drying section is driven off as vapour into the atmosphere. To get rid of the vapour, without making the machine room unbearably steamy and damp, the drying section of the machine is covered in by a gigantic hood. From this the vapour is withdrawn by exhausting fans. The provision of a hood, however, by no means solves the problem of vapour removal. The vapour has a tendency to accumulate, in modern wide machines, in the pockets formed by the loops of paper passing round the cylinders so that damp streaks may persist in the paper. In some instances perforated pipes are arranged horizontally in the pockets. Hot air is supplied to the pipes and assists the drying in the region of the pockets. The initial removal of the water by gravity through the wire is also accompanied by difficulties. One of these is that the difference in temperature between summer and winter is accompanied by a difference in the viscosity of the water, that is, in its readiness to pass through the wire. The flow of water through a large pipe, for instance, is not appreciably affected, but when water has to get through the minute holes of a wire, the rate at which it can do so is much lower in winter than in summer. Thus attention has been paid of recent years to the maintenance of an even temperature all the year round in the machine room and in the stock. As the first is large and the second involves huge quantities of water, this even temperature cannot always be obtained economically, but in some instances the vapour from the drying section is used to heat the air entering the machine room, the two not being mixed. So far, 10 per cent of the heat carried off in the vapour is all that it has been possible to use for this purpose. The paper as it enters the drying section may contain perhaps 66 per cent of water; when it leaves that section there may be only about 4 per cent. Complete drying is never attempted, for the paper in this stage still bears the marks of the wire and felts and these are more easily ironed out if the paper is slightly damp. The marks are not always altogether got rid of, as an examination of a newspaper with a magnifying glass under a good light will show, but, in general, a smooth surface is obtained. This smoothing is done in what is called the calender stack, a series of polished rolls piled one above the other. The paper comes in between the top two rolls and passes in and out of the rolls below, being delivered from between the bottom two rolls. The bottom roll of all is driven by an electric motor, the remainder being rotated by friction. The rolls are highly polished and are pressed together by an arrangement of weights or springs. The rolls are generally kept clean by “doctor” knives. The paper on emerging from the calender is now finished and is wound on a reel. There is generally an automatic arrangement for changing a full reel for an empty one. This operation is one of the most mystifying things for a visitor to watch. The paper comes out of the calender at the rate of anything between 800 feet to 1,400 feet a minute, and suddenly parts from the full reel. The free end flicks on to the empty reel, which then goes on winding it up. The cutting of the paper and the flicking of it on to the empty reel are effected by a jet of compressed air. Compressed air is used also for leading the paper into the press section when starting up and after a break. PREPARING THE WIRE of a 226-in Fourdrinier machine. The endless wire cloth band receives the watery stock from the flowbox on the left. The top strand is partly supported by the table rolls, two of which are not yet in position. The men at the right are adjusting the suction couch roll. Near them, under the raised part of the wire, are seen the suction boxes. Certain complicating factors have a great effect on the methods by which the immense amount of rotating machinery in a newsprint machine is driven. At the wet end of the machine the main requirement is to keep the flow under the slice at such a rate that the fast-travelling wire is easily covered; but as soon as paper is formed a rather complex system of conditions arises. In the press section the paper is squeezed and tends to lengthen; then, when the drying section is reached, it begins to shrink and finally in the calender stack the thickness is again reduced. At first sight it would seem that as long as the peripheral speed, that is the speed of the surface, of all the various rollers is kept the same the paper should go smoothly through the machine, but when the factors of thinning and shrinking are taken into consideration it becomes clear that the problem is not an easy one. It is necessary to increase the peripheral speed progressively all through the machine so that the speed of the paper is about 10 per cent quicker when it leaves the calender than when it leaves the suction couch roll. The speed is not increased at a constant rate but in certain definite proportions in the different sections. The drying section is much the longest and the strip of paper in it at any moment is not all travelling at the same speed, strange though it may seem. This section has therefore several different and independent drives in its length. Most modern machines are driven by electric motors and all the motors for the different sections must keep step. To effect this some interesting control systems have been developed and no motor is allowed to go faster or slower than it ought to. The machine as a whole can be slowed down or speeded up within limits. If the drive in a section nearer the calender exceeded its set speed, the paper would be pulled apart as the section farther away from the calender would be, relatively, “holding back”, and if it went slower than that speed a loop would form. Breaks, however, do occur, and the paper maker is well satisfied if he can run as much as 100 hours without one. The paper machine does not stop, unless the paper breaks, from early on Monday morning to late on Saturday night, and on Sundays the engineers put in a strenuous time overhauling and inspecting the machine. In 1697, it is recorded, a hard day’s work for six men was the production of 600 lb of paper, and then it was in sheets only 20-in by 30-in. Nowadays six men - or more accurately three men (machine man and two men for drying) and three lads - can, with some 2,600 horse-power from the river to help them, produce 200 tons in twenty-four hours. These figures refer to the newsprint machine only. For the making of the stock, the grinding, digesting and other processes a number of other men are required, as well as more power. To watch a modern newsprint machine at work and to compare it mentally with the old laborious hand process, is to realize the power of the engineer of to-day over the forces of nature. It is true that mastery has involved long hours over the drawing board and with the slide rule, days of experiment, observation and calculation; yet in the end the engineer has forced mighty rivers to give up to him their power. He has transformed and subdued that power so that, constrained by wire and switch, it obeys his commands. He has assembled from mine and quarry, tree and worm, materials to make his machines - iron, copper, tin, aluminium and zinc; shellac, rubber, mica, cotton, silk, porcelain and glass to confine his electric currents. He has investigated the secrets of reacting chemicals, the mysteries of friction and lubrication, the harmonies of swiftly-moving masses. But, there is one direction in which all this science, all this labour, all this skill, fall far short of the gropings of ancient days. Newsprint is not durable and the clay tablets of Babylon, incredibly ancient as they already are, may yet survive it. THE CALENDER SECTION of a machine in which the paper is given a smooth surface by being passed in a zigzag course through a number of rolls under pressure. The rolls are highly polished and are pressed together by an arrangement of weights and springs. Having left the calender, the paper is wound on a reel. The reel seen above is nearly full and is slung from a crane ready for removal. You can read more on “Magazines by the Million” on this website.